I’ve been walking a lot in the cemetery. I’m lucky enough to live near a cemetery that is also a historic landmark, Greenwood Cemetery in Brooklyn. It would be beautiful by any standard: 478 acres of century-and-a-half-old trees, paths, and sweeping architecture. Giant koi swim in a reflection pond down the hill from 19th-century mausoleums. There are wandering geese and turtles and a cat that may or may not be a ghost. Today, as I walked a path around my favorite pond, little frogs plopped into the water in front of me like synchronized swimmers. I guess you could say, odd as it sounds, that the cemetery is my happy place. I’ve needed a happy place lately. My lifelong chronic depression, usually well-managed by the medication I take daily, is having one of its occasional flare-ups. I spent most of last week in bed, getting better acquainted with the landscape of my walls. When depression happens, I know the things to do, although actually doing them can feel like an impossible task in the face of a disease that makes just getting to my own couch seem overwhelming. But this time, none of the usual things were helping — not exercise or meditation or therapy or reaching out to friends. I was immobilized and functioning in only the most basic sense — unable to work, shower, even watch TV. 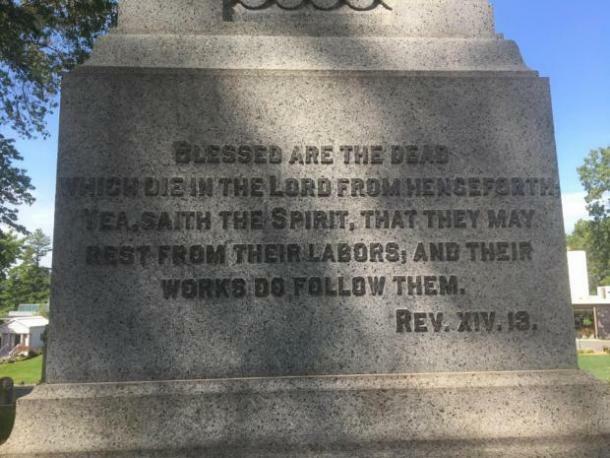 Then I started walking in the cemetery. I’ve always been fascinated by cemeteries. A longtime history buff, I can remember being a child and poring over a cemetery bearing my family name in Mt. Pleasant, Texas. Who were these other McCombs who were distantly related to me, many of them children like me? I feel the same sense of childlike fascination in the cemetery today — to stand by a crumbling gravestone grown over with weeds and wonder about the person who once lived feels like a sacred meditation, something worth rolling yourself out of bed for. Since I’ve been making myself take these daily “depression walks” through the cemetery, as my fiance and I jokingly call them, I have started to pull myself out of the sludge, just a little. Part of it is simply the twin balms of going outside and moving around, always my first line of defense against my janky brain chemicals. And nature usually helps pull me outside of myself long enough to offer some relief. But being among the dead is also peaceful in a way deeper than most things. A cemetery, to me, is a place of reflection and comfort. In the recovery community I’m a part of, many of us use the concept of a “higher power” to help us stay sober. It doesn’t have to be God. It can be a strawberry, Dolly Parton, or the recovery group itself. My concept of a higher power is amorphous and shifts from day to day. But the key, for me, is to acknowledge the existence of something bigger than myself. That might be a tree I had no part in creating, the uncontrollable mechanisms of the universe that shape our destiny, or the concept of life and death itself. In that sense, I feel God at the cemetery, as much as others might at a church. It’s a comfort to unburden myself of the imagined responsibility that I must control it all. And being among the dead rightsizes my problems, makes me feel small like staring at the ocean. After all, we are all being carried along toward the same inevitable fate as the men and women whose headstones I pass on my daily strolls. The best we can hope for is that someday someone will stop to calculate our ages and wonder about our lives after we’re gone. Nothing that is currently overwhelming me is built to last — none of my problems, disappointments, or perceived failures. Life is short, both the good parts and the bad. And it may sound depressing, but to me it’s a peaceful thought: One day, we all get to rest. My cemetery walks haven’t cured me. This bout of depression is a particularly virulent strain, resistant to the usual treatments. But they’ve helped, a little bit, day by day. The other day, I walked so far into the cemetery that I lost my way and wandered for several hours before finding an exit, getting increasingly frustrated and irritable. These are feelings, I’ll take them over numbness. Some day the feelings will be better ones. Until then, I’ll make myself get out of bed and get dressed. I’ll put on shoes. I’ll take a walk. Should You Take Anti-Depressants During Therapy?